"Stay out of trouble! 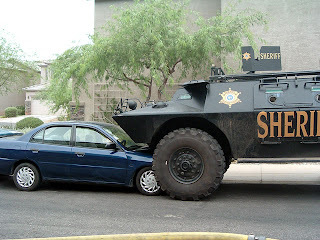 ": Meet the future of law enforcement. Until recently, Juan Rodriguez was a freeway patrolman employed by the City of Chicago. Now he cruises the Chicago Skyway “for private owners,” reports the current issue of Business Week. “In the past, [Rodriguez] had to write out a ticket for each problem” -- such as disabled vehicles, potholes, tire debris, and other traffic impediments. It would often taken the sclerotic municipal services department days to deal with the backlog. When news of the T-TC hit rural Texas and Oklahoma, residents became understandably concerned. The editorial pages of the newspapers that serve those small communities began to resound with outrage: Nobody had asked them for input regarding a deal with a foreign-owned business combine that would drive many of them off their land – and create a toll road that would sluice profits into the coffers of that same foreign combine. The Macquarie-Cintra combine heard those complaints, and acted swiftly: Macquarie purchased all of the small-town newspapers along the T-TC route. Now the newsrooms that once resounded with opposition to the combine are owned by it. In just the last few years, Macquarie Bank – roughly a decade old – has become a major player in the new niche market of buying up transportation infrastructure, such as bridges and roads. It has spent billions of dollars to buy assets of that sort throughout North America. Along the way, it has made some other interesting acquisitions as well: Besides the rural newspapers in Texas and Oklahoma, Macquarie bought out Giuliani Capital Advisors (GCA), which has about 105 employees in several major cities, including Chicago, New York, and Los Angeles. Created by that Giuliani in 2004, GCA specializes in bankruptcy restructuring and corporate mergers, both of which we will be seeing in abundance, if my suspicions are correct. Macquarie was cleared by the Federal Reserve Board (.pdf) “to open representative offices in New York ... and Houston, Texas” in November 2003. Hmmm.... Could “any asset” include such things as highways, bridges, airports, municipal utilities, and other publicly operated infrastructure now “owned” by debt-plagued states and cities? “With state and local leaders scrambling for cash to solve short-term fiscal problems, the conditions are ripe for an unprecedented burst of buying and selling,” continues Business Week. For instance, Bernanke said, the Fed and feds could hold deflation in abeyance by printing up bales of money and dropping them randomly from helicopters. This was inspired by a sarcastic comment once made by Milton Friedman. Oddly enough, the Fed managed to do this very thing in Iraq, dispatching pallets full of shrink-wrapped “cashpaks” to the Coalition Provisional Authority; the newly minted FRNs were often handed out from helicopters, as well as the back of trucks and jeeps, to all and sundry, and probably wound up buying some of the munitions now used to make orphans and widows of US military families. He also noted that the Fed could buy up “a wide range of private assets,” including corporate bonds, bank loans, and mortgages. In order to hold deflation at bay -- that is, to spare us the horrors of falling prices --the Fed under Bernanke was prepared to create ever-depreciating dollars in sufficient quantity to buy everything in sight. "There's no limit to what the Fed is prepared to do. The only tool it has is inflation--creating money out of nothing. And Bernanke has explicitly stated that the Fed has the statutory means to use the money it creates to buy anything and everything, including stocks, bonds, houses, and raw land. It's entirely possible that someday we'll see the banking cartel literally owning everything--and Americans are letting this happen." Why couldn't the Fed carry out this buy-out by way of foreign investment conduits – like the enigmatic Macquarie, and the equally mysterious “bidders from Portugal and Brazil” who were so eager to lend the embattled Steve Hogan a hand? After all, if Daughty's suspicions are correct, the process would have to start somewhere. Why shouldn't the pioneer be the previously obscure Australian bank that now owns the Chicago Skyway, the Indiana Toll Road, a string of refractory rural newspapers in Texas and Oklahoma, and a mergers-oriented financial firm it bought from the current front-runner for the 2008 GOP presidential nomination? Macquarie may have been the first into the pool, but plenty of others are diving in: Goldman Sachs, Morgan Stanley, the Carlyle Group, Citigroup – all of which are very tight with the Fed, and all of which are exemplars of that perverse variety of oligarchical crony capitalism known as corporatism. In that system, the risks are subsidized, the losses are socialized, and the profits are privatized. In the current example, these investors are buying (with capital provided through Fed inflation) infrastructure that was created and maintained with tax dollars. As Business Week observes, infrastructure investments create “captive customers,” so “the cash flows are virtually guaranteed.” If the deals still don't work out, state and municipal governments (or, more likely, Washington) will step in and buy back the infrastructure concessions – or the Fed might find other investors, which is pretty much the same thing. Consumers will be treated to monopoly pricing – always such a joy – and taxpayers will find no relief, because the politicians who sell off infrastructure concessions have already earmarked the profits for favored constituencies. 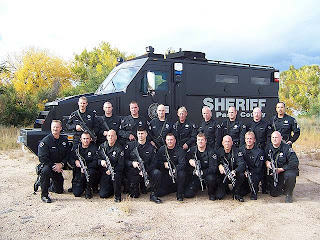 Question: If the Fed can buy up the physical assets of embattled city and state governments, why can't it buy up their law enforcement agencies as well? Answer: It already has, at least in principle. When I saw that film twenty years ago, it struck me as uncannily prophetic. (I speak of the original, not the pointless sequels.) 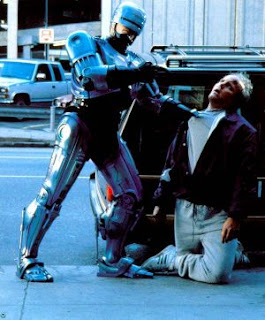 Of all the dystopian visions available in literature and on film, RoboCop (directed by Paul Verhoven, a Dutchman) created an uncannily plausible vision of American totalitarianism – not the dismal, leaden grayness of Soviet Communism, or the lurid pageantry of Nazi Germany, but rather a society run by an all-pervasive corporation that controls its subjects through a combination of synapse-killing mass entertainment and soul-chilling violence. In that world Omni Consumer Products is the government; it is the military, the police, and the media. We're not in RoboCop world yet, but we can see its suburbs from here. To those eagerly awaiting a long-delayed installment of Pro Libertate: the e-journal, I say: Nil desperandum -- it will be available shortly. I have been invited to address the upcoming Spring Convention of the United Republicans of California (UROC) on May 19 in Arcadia, California. The website of the Christian Liberty Party has an audio recording of my April 21 address to the National Committee Meeting of the Constitution Party in Boise, Idaho. 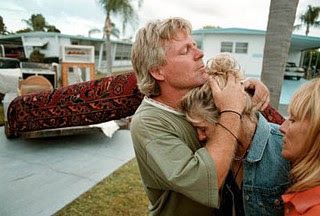 I wish to thank Keith Humphrey for making that speech available, for maintaining an amazingly information-dense website, and for his incredible generosity toward my family. And I'm still working on final edits to the manuscript for my new book, tentatively entitled From Republic to Reich: How the Imperial Executive Devoured the Bill of Rights. I'll let you know as soon as it's available. The Right Source offers in-depth articles, both in its current news and archives, dealing with this and other important stories. Please check it out. I want to thank Jerri Lynn Ward for inviting me on her program "I Object! Justice Examined" to discuss (along with Dr. Herb Titus) the right to keep and bear arms. Those interested in listening can hear the program on Right Talk radio; click on Miss Ward's icon at the bottom of the page. The program will re-start at five past the hour for the next day, and will be available as a podcast after 7:00 PM this evening. As you listen, please bear in mind that I am, once again, battling a bad chest cold -- so I hope the coughing and sniffling aren't an insuperable distraction! 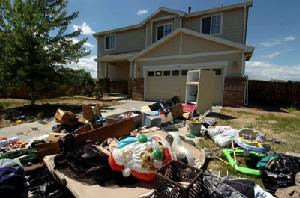 Evicted: Abandoned personal effects were piled on the lawn of this foreclosed home in Colorado's Adams County. The Sheriff's Department emptied the house and changed the locks. With the Dow peaking above 13,000, the most observers direct their gaze skyward as they wonder how much higher the market can climb. Few are taking the time to examine the market's decayed and crumbling foundation, as they wonder how soon the structure will collapse. The market is not built on rock or even on sand, but rather perched precariously atop the housing/mortgage/refinancing bubble the Federal Reserve so diligently inflated during the first half of the decade. Wall Street's necromancers have transmuted debt into “wealth” by creating exotic financing mechanisms to encourage mortgage lending to dubiously qualified – or entirely unqualified – home buyers, and then securitizing those loans for investors. This scam – like many others -- works fine as long as the housing bubble continues to expand. Now that the bubble has burst, defaults and foreclosures on “sub-prime” mortgages are mounting. Hundreds of thousands of families have lost their homes; neighborhoods and communities are being ravaged; and municipal governments face what could be called “gentrification in reverse” -- the creation of vacant, deteriorating urban areas that become magnets for crime. The last to suffer will be those who most richly deserve to – the Fed-allied financial interests who have facilitated the entire scam by luring people into unmanageable debt. Euclid's city government, which claims an annual property tax shortfall of $750,000 from the vacant houses, has hired new building inspectors and has taken out a $1 million loan to pay for “rehabilitation, demolition, and lawn care at the foreclosed houses.” The city anticipates recovering those costs through tax assessments when the renovated buildings are sold. What if, in an ever-softening real estate market, they don't sell? Well ... the one constant here, from the municipal government's perspective, is the need for more revenue. So homeowners who have kept up with their mortgages, or own their homes outright (as opposed to renting them from the bank, which is what a mortgage amounts to), will see their taxes go up – dramatically, I'll bet. I suspect this process is behind yesterday's (April 25) USA Today headline: “Property taxes up as house prices fall.” The story explains that despite the housing downturn, “the market value of millions of homes still exceeds their assessed value used for tax purposes.” Many homeowners are caught in an interesting predicament: The value of their homes hasn't declined quickly and steeply enough to help them avoid a tax increase, or an abatement in their taxes corresponding to the reduction in their equity. Well, why not? With household budgets already under stress from increases in non-discretionary spending – food, energy, and housing – why can't county governments bite the bullet and take in a little less? There are countless ways to answer that question, but they can all be easily digested into this simple proposition: County governments have constituencies to feed, and they have Sheriff's Departments to command. So you pay what they tell you to pay, or wind up like the Sundsmos. A rising tide lifts all boats, and (to alter the metaphor) a collapsing nation-wide real estate bubble is likely to drag everybody down – beginning with those who are trying to get out of mortgages they can't afford to pay. As an earlier USA Today story pointed out, foreclosures on sub-prime mortgages depress housing values in entire neighborhoods. “Why pay full price for my house when you can pick up a foreclosure for $30,000 or $40,000 less?” asks Dannice Clark, a postal worker from Atlanta who is trying to sell her home. Among those who are seeing their equity evaporate, warns Dan Immergluck of the Georgia Institute of Technology, are homeowners who qualified for interest-only mortgages, which are poised to re-set. “I'm concerned that could really tip some of these middle- and upper-income neighborhoods, in terms of high foreclosure rates,” Immergluck warns. In Georgia' Gwinett County, as in Ohio, Michigan, and elsewhere, many abandoned homes have been neglected by the banks or other lending institutions that own them. Some of them quickly fall prey to vandalism, or attract squatters. This, in turn, leads to an increased police presence, often carried out by “Quality Of Life” (QOL) units, who are tasked to enforce building codes and ordinances dealing with graffiti and vagrancy. The creation of QOL patrols was inspired by the “broken window” premise -- that is, a broken window, littered sidewalk, or unattended home "sends a signal" that a neighborhood is fair game for reprobates. One commentator summarizes that theory thus: "[T]he smallest symptoms of antisocial behavior will, left to fester, breed greater and greater crimes, all the way down to murder." While there may be some merit to that theory, in practice -- as in New York City under the reign of Il Duce Giuliani -- "quality of life" policing has sometimes led to replacing the anarchic violence of street criminals (or merely the unsightly spectacle of street beggars) with state-sanctioned violence -- such as the unpunished murder of private security guard Patrick Dorismond by undercover New York narcotics officers. Taken in the abstract, QOL-oriented policing seems like a good idea, if only because it addresses the age-old complaint that there's never a policeman around when you need one. The problem, once again, is found in the practice, rather than the principle. In practice, QOL policing means the ever-increasing presence of armed government agents in the employ of revenue-starved governments, there to enforce often obscure ordinances regulating how you cut your grass, care for your lawn, paint your house, maintain your car, and even feed your dog. And intrusions of this sort can now be justified as a way of helping to keep property values up in your neighborhood -- as if anything you can do would have a bigger impact than the Fed's manipulation of the money supply. In prosperous and stable times, this is a formula for trouble. What happens when the prosperity (or at least the illusion of the same) is gone? Think of it this way: Quality of Life policing is a creative way of weaving armed agents of the state into the fabric of a community, just as the unwinding of the housing/mortgage/refinancing market causes that social fabric to become undone. In this clip from Boston Legal, Alan Shore -- the high-viscosity uber-lawyer played by James Spader -- peels the skin off an attorney representing the credit card industry. Shore's soliloquy is filed under "Things I Wish I Had Written," and, in fact, it does remind me a great deal of at least one essay I did write. Make sure to visit The Right Source. It is because Daniel Lazare makes no effort to disguise his contempt for the US Constitution that he enjoys the luxury of candor about its provisions. In his 1995 book The Frozen Republic, Lazare assailed the Constitution for “paralyzing democracy” -- which was one of the key objectives of the Framers, who did not share Lazare's enthusiasm for “majoritarian absolutism” (as one critic aptly described the author's philosophy). To his credit, Lazare doesn't claim to have found some previously concealed progressive subtext in the Constitution, or offer flatulent platitudes about the “true” meaning of the “living” document. He admits that the Framers created a system in which the powers of the State were to be limited by a written text and not easily expanded through demagogic appeals to the mob. Even here, Lazare misses the most important point, namely that neither the Second Amendment nor any other part of the Constitution could be said to “confer” rights of any kind; rather, they protect unalienable rights by specifying what government can do, and a few of the myriad things it is prohibited from doing. Despite his subtle denial of innate individual rights, Lazare's admission against interest is useful, as are his pointed words of rebuke to fellow “liberals” (here meaning left-leaning collectivists, not lovers of individual liberty) who interpolate their political prejudices into the Constitution's text. “We have long been in the habit of seeing in the Constitution whatever it is we want to see.,” Lazare admits. “Because liberals want a society that is neat and orderly, they tell themselves that this is what the Constitution `wants' as well.” That desire translated into, among other things, a “purely collectivist reading” of the Second Amendment, in which the purported right mentioned in the text is that of states to create and regulate “select” militias; this is in contrast to the “individualist” view, in which the right to bear arms – like those of speech, freedom of worship, and all other rights and immunities protected in the Bill of Rights – is exercised by the individual. The “collectivist” view, Lazare writes, “is becoming harder and harder to defend” as more honest scholarship – that is, honest scholarship, more widely reported – demonstrates what should be obvious: The American Founders, who had wrested independence from Britain in a war that began with gun-toting citizens repelling an effort to disarm them, were determined to protect the individual right to armed self-defense. And nothing could be more alien to their intentions than the “collectivist” view of firearms ownership. Does anybody really think it's a good idea to let Bucketheads like these have all the guns? The Second Amendment does explicitly protect an individual right to bear arms, but its real significance is that it denies the government a monopoly on the legitimate use of force. The typical political science textbook published in the last five decades will either assert or assume that government claims a monopoly on force. This is Lenin's vision -- “power without limit, resting directly on force” -- not that of Jefferson, et. al. -- namely, that of governments as contingent entities “deriving their just powers from the consent of the governed,” and subject to abolition when they exceed their modest mandate. They can't operate a parking brake on their federally funded Gestapomobiles, but they're uniquely qualified to carry and use firearms. Lazare, like every other commentator, politician, or scholar who wants to transmute the individual right to armed self-defense into a limited, State-granted privilege, is on Lenin's side of this argument. He's simply more honest than most, even though his concessions are heavily seasoned with condescension toward the supposedly archaic views of the Framers. Lazare's writing is shot through with the sort of smug historicism one would expect of a modestly bright undergraduate: How could a group of unenlightened white males – most of them Christians of a repellently literalist sort – who gadded about in powdered wigs and tricornered hats possibly have anything worthwhile to say about our modern society and its problems? The obvious answer is that the Framers knew a great deal about human nature as magnified by political power, and that because of their sound insights the US Constitution, unlike a milk carton, doesn't contain an expiration date. Nothing that has occurred since 1787 has invalidated the wisdom of the Framers in decentralizing political power and denying the State a monopoly on force. Exactly the opposite is the case: When viewed in retrospect across centuries littered with war and political mass murder carried out by states that claimed a monopoly on coercion, the honest observer whose mind is not hostage to collectivist delusions is astonished at the Founders' foresight. 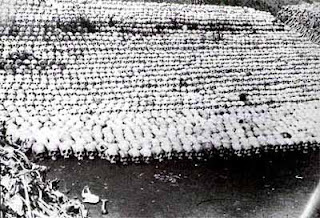 “Heavily armed maniacs” of the sort Lazare alludes to can kill dozens of unarmed innocents. 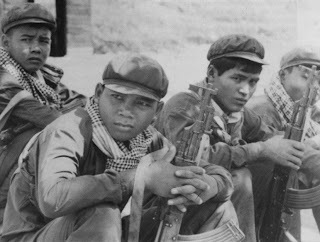 Heavily armed maniacs in the employ of the State, and clothed in its supposed authority – the oh-so-helpful Khmer Rouge soldier quoted above, for example -- have killed tens of millions of disarmed victims. Important though the first consideration is when we're discussing the right protected by the Second Amendment, it is the latter that best illustrates why that Amendment could be considered the Constitution in microcosm. Make sure to drop by The Right Source. Edmund Burke: "Defeatist" regarding England's war with America. "I believe myself that the secretary of state, the secretary of defense — and you have to make your own decision as to what the president knows — that this war is lost, and that the surge is not accomplishing anything, as indicated by the extreme violence in Iraq yesterday." The problem with Reid's assessment is not in its “defeatism,” but rather in its moral cowardice, a trait that runs through the Democrat leadership like a vein of fat in a well-marbled steak. The war in Iraq “is lost” indeed, but not because of a tactical or strategic failure. America – the country, as distinct from the pack of criminals and degenerates we're told to call “our” government – lost that war the moment it began. And patriotism demands that the government lose that war as well. Let me be unambiguously clear on this point: I want the federal government to lose the war in Iraq. As a patriot I must oppose wars prosecuted in an unconstitutional fashion. As a Christian I am required to oppose aggressive wars of any kind (including those declared by Congress). As a father, I have no intention of letting the State steal the lives of any of my five children – or those of any other parent, if I have the ability to prevent it – and waste them in depraved ventures of this sort. Unless the Regime is forced to concede defeat in Iraq, withdraw our troops, and punish the policymakers who led our nation into this abominable mess, we're in for a generation or more of similar undertakings across the globe -- assuming that our country doesn't descend into unalloyed despotism and economic ruin much sooner. There was a time when conservatives fiercely and consistently opposed war, and did not flinch from urging the defeat of such iniquitous undertakings – as a patriotic imperative. 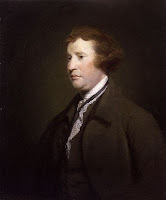 Two hundred and thirty years ago (April 3, 1777, to be precise), the estimable British statesman Edmund Burke wrote a letter to the sheriffs of Bristol, a city Burke represented in Parliament. The war against the upstart American colonies was in its second year, and Burke – who had vigorously opposed the war on solidly conservative grounds – was dismayed and disgusted to the depths of his soul. Like many genuine English patriots, Burke couldn't countenance the creation of a rented “coalition of the willing” -- “German allies of twenty hireling states” against the colonies, and he may have taken some ironic satisfaction in the fact that the Americans were holding firm. 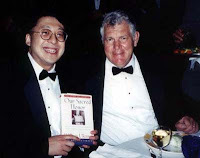 "Impotent, helpless creature[s] ... bloated with pride and arrogance": Neo-con war boosters Johan Goldberg and Richard Perle (l.), and William Bennett (right, on the right). The war in America was fought to prevent the dismemberment of the Empire, Burke observed, but it was imperiling the Anglo-Saxon system of liberty under law that made the Empire worth saving (in his view). He was particularly exercised about a measure proposed in February 1777 that would suspend the habeas corpus guarantee. Honest and well-informed people would recognize in that measure the ancestor of the Bush Regime's Military Commissions Act, which suspends habeas corpus protections of those accused of involvement in terrorism, and provides for their indefinite detention. 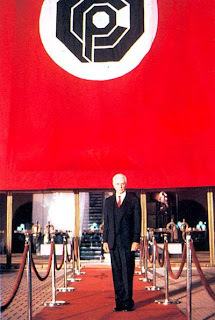 For speaking and writing in defense of the rule of law and in opposition to the war, Burke wryly noted, “I am charged with being an American” -- the direct equivalent, in that time, of being accused of sympathizing with “Islamo-Fascists” today. Burke wasn't an American, of course; he was a loyal and patriotic British subject who wanted his government to abandon its demented war for the good of everybody. And in this he was in good and plentiful company, as Weintraub's book documents: Most conservative figures in London, as well as some radicals, opposed the war with America, and were hardly diffident in expressing their views. In 1764, during a parliamentary debate over taxing the colonies, Colonel Isaac Barre (a veteran of the French and Indian War) rose to rebuke those who insisted that the long-indulged American colonies needed to be reduced to servility. 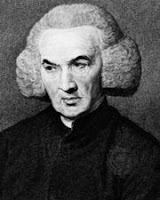 Dr. Richard Price, a parson-philosopher who was a close friend of Benjamin Franklin, argued in a pamphlet entitled An Essay on Civil Liberty and the Justice and Policy of the War with America that the war would be a financial, moral, and political disaster for England. Heeeeeeeeeeere's Johnny Wilkes: The MP and radical Lord Mayor of London, as depicted by Hogarth. Rather than being hauled to gaol as a traitor, or even widely reviled as a defeatist, Price was well-respected in London, whose mayor, the radical John Wilkes, made no secret of his opposition to the war. "We are fighting for the subjection, the unconditional submission of a country infinitely more extended than our own," Wilkes insisted. As a proud English patriot who championed “universal liberty and the rights of all mankind," Wilkes predicted that "no part of the subjects of this vast empire will ever submit to be slaves." London attorney William Hickey organized a small group of prominent parliamentarians who condemned “the folly and injustice of the Government in endeavoring to dragoon the Americans into unconditional submission....” Hickey and his companions offered a daily toast, “Success to the Americans” -- and one of them even named his private cutter Congress. As I've noted elsewhere, David McCullough's book 1776 offers many examples of outspoken English opposition to the war with America. One London newspaper denounced the escalating British war against the rebellious colonies as "unnatural, unconstitutional, unnecessary, unjust, dangerous, hazardous, and unprofitable." Another denounced the King, regarded by many as a dim-witted and shallow man (he wasn't), as "foolish, obstinate, and unrelenting" for his determination to take the country to war. Similar sentiments resounded during the legislative debate over King's October 1775 war speech. One critic described the King’s war plans as "big with the most portentous and ruinous consequences"; he was particularly opposed to sub-contracting troops from foreign powers, a move he called an "alarming and dangerous precedent." 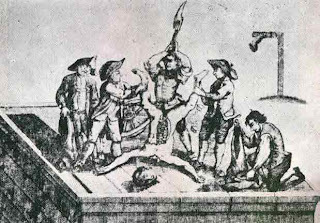 These critics of King George's war in America, it should be remembered, lived under the shadow of the Treason Act of 1351, which dictated death by decapitation for nobles, and by torture – being drawn and quartered – for commoners convicted of the offense. At the very least, they faced the prospect of prolonged imprisonment under the anti-dissent law opposed by Burke. Yet they spoke out against the American War with a vigor and candor not displayed by the likes of Harry Reid. Like the rest of what passes for leadership in his pusillanimous party, Reid is willing to criticize the Bush Regime's incompetence without telling the unvarnished truth about the war itself, to wit: It was an abomination from the beginning, and should be brought to an end immediately. In any case, it must be said that the War against the American Colonies waged by England's King George III, however monumentally unjust, was more defensible than the war in Iraq waged under America's King George II. True patriots know when to root for their government's defeat. This is such a time. Make sure to check out The Right Source. I'm going to be on "The Jaime Johnson Show" on KFFF AM 1260 (99.3 FM) out of Boone, Iowa today from 2:00-3:00 PM Central Time. We'll be discussing the renewed campaign for civilian disarmament in the aftermath of the government-facilitated mass murder at Virginia Tech. Resistance is futile: A Taser warning posted in an Idaho courtroom (courtesy of Pro Libertate reader SW). "I recently obtained my CDL license in my home state (Georgia.) Before I could obtain [it], I had to participate in the "Highway Watch" program, which basically meant watching a video and answering three questions at the end. The program basically instructs drivers to spy on their fellow citizens and report any "suspicious activity" to, you guessed it, the government (via 911 or the local police.) Alas, the police state mentality might very well infect a profession known for its individualist, no-nonsense nature." 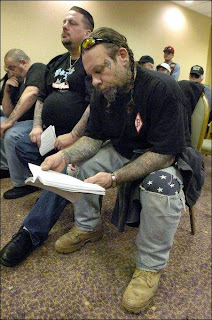 Pagans pay their respects: Pagan OMC members who knew Derek Hale (below) at the March 23 press conference in Wilmington, Delaware announcing the lawsuit on behalf of Derek's widow and family. "I would ask you to look at this line in your article: `In addition to his honorable military service (albeit in a consummately dishonorable war)'.... Now you are supposed to be a professional writer. The above sentence makes no sense at all. 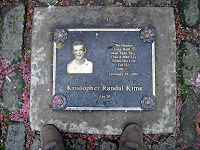 How can you say this brave young man was honorable, and then claim he participated in something dishonorable? I know you left wing nut jobs can’t just come out and say what you really mean. But when you write about a man you can’t hold a candle too how bout attempting to control your contempt for our Country. And spare us all with any answer that you support the troops but not the war. That’s another contradictory sentence that only makes sense to left wing kooks." This gentleman's first mistake, of course, is to assume that I'm a left-wing nut job, when my nutjobbery is actually a proprietary blend of libertarianism and paleo-conservatism, and the chief Source of my opposition to war is the anti-war Radical whose teachings are presented in some detail in the New Testament. One of the symptoms of Hannitization (an auto-lobotomy that results from prolonged exposure to White House-aligned media whores) is the inability to recognize that there are many critics of Bush's war who aren't liberals or leftists of any sort. (Another is the tendency to keep reciting White House-disseminated talking points long after they've been worn down to blunt stubs.) This isn't the most subtle of distinctions, but it is lost on talk radio bulimics like my kind and most learned correspondent. Likewise, the moral distinction between the soldier and the cause he's ordered to serve isn't difficult for functioning adults to grasp; it may even be intelligible to Hannitoids. History is tragically replete with decent, honorable men whose sacrifices have been wasted by craven, immoral rulers. Winston Churchill (albeit for self-serving reasons) paid tribute to Erwin Rommel, whom the British leader considered to be an honorable soldier, despite the fact that he fought on behalf of a despicable cause. Like most of those who serve in our military, Derek Hale didn't enlist in the United States Marine Corps because he was eager to take part in a war that is an armed robbery writ large. "`Someone' wants us to look at putting drop down gates in every Iraqi market in Baghdad, then add to that walk-through body scanners. Did I mention the push to seal off the Muhallas (neigborhoods) and have people enter by entering their biometric data? I'm talking fingerprinting and possible iris scans. The Good Idea Fairy needs a 3" 12 gauge load shot at it." These are just some of the "crazy security projects that would make the DHS pee in its pants with glee." "Man, it's simply amazing the money being spent. Don't get me wrong, I've spoken with several Majors and even some senior NCOs and loper ranking officers and most of us agree what we're doing is going in the wrong direction." He and some friends are going to try "to reduce the number of projects and decrease the waste," but he's not optimistic. "Over here, there is like this contest no one dares speak of (but we lower folks see it) where commanders try to outspend each other," he comments. "It's as if spending money on projects is a sign of good civil military operations. I mean, $225,000 to pick up the trash in a neighborhood? i know the trash is bad, as well as the security situation, but man!" He's also worried about the possibility that the strategic savants in the executive branch are going to wind up losing an entire army in Iraq. "If we go into Iran, it may happen," he writes. "It would not take much to starve us out. Whenever the crap hits a fan, people will always choose the side that will save their neck. In this case, it will not be to side with the U.S. forces. We will be prevent[ed] from using nukes due to the proximity to our own troops. And having to take care of contractors and service members? Ouch..... Shoot, we wouldn't be able to feed or fuel ourselves since it's contracted out. Heck, in Kuwait and here in Baghdad, [Halliburton spin-off] KBRschedules flights. Man, what have we become?" "Maybe i need to start making some Christian contacts or here in case we get cut off and overrun?" he concludes. "I call it: `the purge' (aka plan B). :-) Now I learn I'm here for 15 months. I think it will be longer...maybe 18. The truth is always the first victim of war." "We moved from Florida back to Oklahoma last July and are very happy to be home where we belong. Our new 1978 ranch style is on an acre-and-a-half and we are remodeling it to our taste. The little town of Harrah, OK, is like the TV `Mayberry' in a lot of ways. There is one way, however, that is definitely not like Mayberry. Harrah has about a 4500 population and a small police force, the Harrah Police Department (HPD), that transfers phone calls after 1800hrs to the county sheriff's station. Would you believe that they (HPD) have recently purchased fifteen sniper rifles with a $10,000 grant through the fed's program?! They cannot justify in my mind a need for one, let alone fifteen. 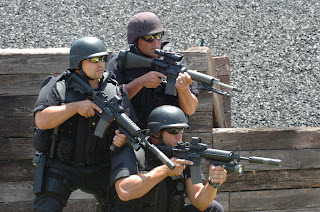 The ammo they are burning up having `fun' is coming out of our tax dollars for the `boys' to play`"SWAT.' The fire station also enjoys federal `assistance' from similar sources. Knowing what I know, it's a very scary prospect...."
And for those of you who are interested, I'm presenting a photograph taken a few days ago by my son, William Wallace, of our German Shepherd, Chief -- who may prove to be my undoing if he doesn't fatten up to the satisfaction of the local branch of Leviathan. 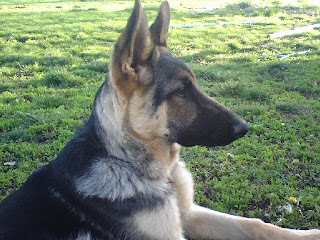 Poor, abused little thing: Chief, our 6-month-old German Shepherd pup, an alleged victim of felonious animal mistreatment. This Saturday (April 21) I will be speaking at the Spring National Committee Meeting of the Constitution Party in Boise. My topic will be "Paying the Price of Principle." Next Thursday (April 26) at 3:00 PM EST I will be a guest on Jerri Lynn Ward's Right Talk Radio program "I Object! Justice Examined." 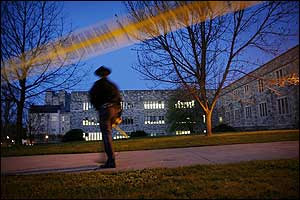 We will discuss the government-aided mass murder at Virginia Tech. For those who have expressed concern about my wife Korrin (scroll down to the end) and offered prayers on her behalf: She is doing better, and -- thank God -- hasn't had to be hospitalized again, at least not yet. It was one year ago this week that her health took a dramatic and life-altering turn for the worse, and she's been in the hospital four times during that period; on one occasion she was very close to death. Thank you so much for thinking of, and praying for, her and the rest of us, and for your other acts of kindness and generosity. This week, Kevin Shannon's "The Right Source" radio program has been interviewing Second Amendment activists in anticipation of a renewed push for civilian disarmament. Make sure to stop by The Right Source!